Balquhidder Parish Church is the final resting place of the Scottish outlaw Rob Roy MacGregor. Buried alongside the famous outlaw are his wife and two son’s. Immortalised in song and prose maybe the most famous musings about Rob Roy’s Grave were penned by William Wordsworth while on a walking tour of Scotland in 1803. The grave is an attraction for many visitors throughout the year paying homage to one of Scotland’s favourite characters. 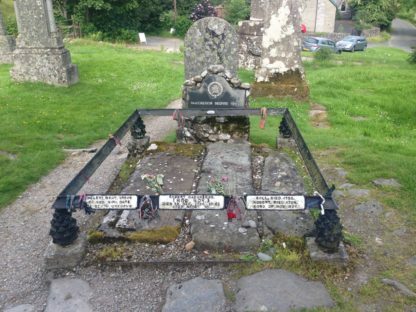 An outlaw to the English and a hero to the Scottish this final resting place of Rob Roy MacGregor is the starting place for learning about his eventful and fateful life. Set in the Kirkton Glen the church is surrounded by scenic mountains. There is a path behind the chruch which will lead you up to the top of the glen. The views are magnificent and give you a panoramic view of the area.